One of the newest safe ride options is a shuttle now operating out of Fiserv Forum's Entertainment District. The Bucks have a Brewers' Shuttle if you buy a drink from the Beer Garden. 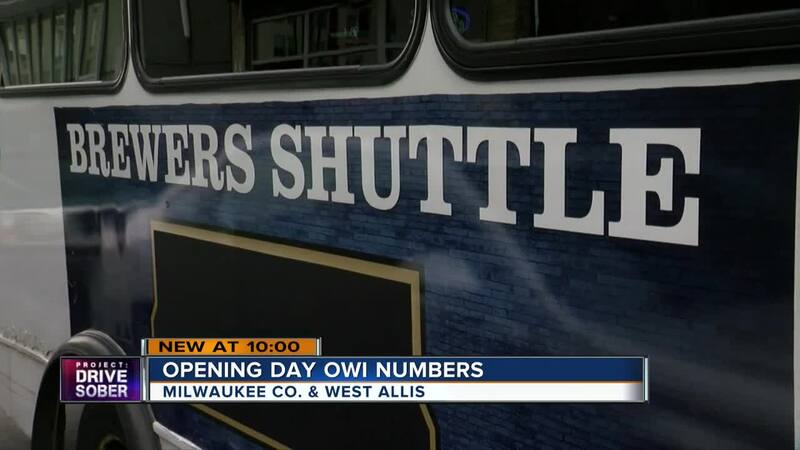 MILWAUKEE — OWI numbers are in for the Brewers Opening Day and it is good news. People were choosing other options to get home. The Milwaukee County Sheriff's Office said of the 78 vehicles cited Thursday, only two were OWIs. West Allis Police also reported two OWIs. "We really concentrate on making sure people are safe whether that be at a Bucks game, going to a Brewers game," said Justin Green, vice president of hospitality for the Milwaukee Bucks. It is the first shuttle for Fiserv Forum's new entertainment district. The Bucks said no matter what team you are cheering for its shuttle program is about heping people make the right choice. "For Bucks' Games we have a designated drivers program that people can pick up coins that are designated drivers and we give away a free non-alcoholic beverage to any that gets that," said Green. "And for this we really want to make sure that people are safe when they are coming here, when they are leaving and that shuttle definitely helps with that." The shuttle will run the entire baseball season.